Every game must be taught. Whether a designer hopes to have her game taught to players by a rulebook, an experienced player, a video, or all of the above, it’s essential to remember that part of a game design is designing its learning curve and learning process. Rulebooks are necessary for any game; obviously a designer can’t rely on her players having access to an online learning resource or an experienced player to teach the game in their group. Unfortunately, rulebooks are problematic for a number of reasons. In my opinion there are two big roadblocks when it comes to learning a game from its rulebook. In my experience, rulebooks are used in three distinct cases: When new players need to learn the game for the first time, when somewhat experienced players are starting the game and need to be reminded of starting numbers for the setup (“how many card do I start with?”), and when veteran players need to look up wording for a specific ruling or clarification. Because of this fragmented nature of the function of rule booklets, they can get really confusing if designers try to achieve all of these goals in one section. New players can get overwhelmed with complex edge case rules that only veterans will need to know. Veterans and experienced players will get slogged down by already-known basic rules when looking for very specific elements. It’s really hard to teach about interlocking parts when you can only describe one part at a time. For example, buffalo (a game I worked on at Tiltfactor) is one of the simplest games you’ll ever play: rules here. Unfortunately it’s harder than it should be to learn buffalo from its rulebook. In designing the instructions, we had a really hard time figuring out the order we should define the terms in. We wanted to define what a “Match” was first, since the rules for refilling the center row don’t make sense until you know how cards are taken out of it. But of course “Matches” don’t make sense until you know what kind of cards there are in the game and how they get to be on the table to form matches with. There are best practices for dealing with these sorts of problems that we’ll speak about in a future post, but suffice to say it’s not as easy as it seems. As any gamer knows, teaching yourself (and your group) a new game for the first time is always rocky. There are rulebooks you have to read but really just want to skim. There’s always the player at the table who isn’t listening and has to be taught a second time. There are poorly organized concepts that have you flipping back and forth to understand the flow of play. As players who try many new games know, the best solution to learning a game is simply having an experienced player teach you—that way you get to skip the big two problems about rulebooks that we mentioned. An experienced player can usually figure out the best order to present the mechanics to ensure their friends understand the system. In addition, since the best way to learn a game is just to start playing (and you can’t really start playing without knowing the rules unless you have a veteran to guide you), being taught the game by a person usually circumvents problems of order in written rules—you learn each rule as you need to know it. Of course, this solution’s not perfect. First, as we’ve noted before, gamers tend to remove the theme of the game when explaining it. I’m definitely guilty of this--a few weeks back I was teaching my girlfriend to play Love Letter. I explained the rules, and she replied “I don’t get it...” A friend of mine who was going to play with us then explained the theme: “You’re trying to deliver your love letter to the princess, and each person in your hand is someone who could be holding your letter. When you discard a person, that person no longer holds your letter. At the end, whoever has the highest number person in his or her is the one whose letter is delivered to the princess, because higher numbers represent proximity to the princess.” Her response was, “Why didn’t you say so in the first place? !” and then we proceeded to play. The second issue with being taught the rules by an experienced player is that the veterans almost definitely going to want to play, which means you’re about to start a game where one player has a distinct advantage over all of the others. Of course, there are ways to mitigate this problem, including the ones we laid out last week. Finally, this isn’t really a solution because a designer can’t assume there’s going to be an experienced player in every group, and even if there is, not everyone is born to be a teacher. The question then becomes, how can instructions approximate the experience of being taught by a real human being? Here are several solutions to help make the learning process easier either through better rulebook design or with auxiliary materials. Obviously, learning from a video is a lot closer to learning from an experienced player. The presenter is free to explain rules in a more narrative way, and visuals and demonstrations can connect explanation to components in the game. A typical video will introduce mechanics and components, show setup, and walk you through gameplay and scoring. The biggest problems here are logistical: it actually takes more time to watch than it does to read, and unlike written rules, learning from a video makes it harder to jump from concept to concept and skim over content you already understand. If it’s already clear how to setup the game, you’ll be frustrated watching a talking head slowly dealing out hands and counting out pawns. Walking new players through the first few turns of their first game, step by step, is the main solution to both of the problems with traditional rulebooks. This is difficult to do with traditional rulebooks because, unlike a human teacher, they cannot have the players draw an event card for the first turn of a game and explain to them what it does without explaining all the types of event cards, thus often overloading the players. With games that are simple enough, though, it might be possible to have a somewhat interactive online rulebook to ease players into the game. While I have yet to see this implemented, tools like Twine, Wikis, and even simple PDFs could be used to actually guide first time players through the setup process, and then lead them through choices they could make in their first few turns. For example, such a tutorial for Dominion might lead the players up to their first turn linearly, and then provide 4 links: “Do you have 2 coppers in your hand?” “Do you have 3 coppers in your hand?” “Do you have 4 coppers in your hand?” “Do you have 5 coppers in your hand?” Since the players would be using a base set, the tutorial could then lay out for them their purchase options, with descriptions of how each one of their options functions and why they might want to buy it. I’ve never seen this done (if you have, please let us know! ), but it seems like it could be used to great effect for games that don’t have tons of exception-based randomly generated content. 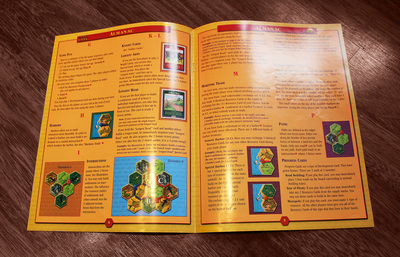 One of the easiest solutions to apply to the problem of multiplicity of rules uses lies in structuring the instructions very carefully, with a segment for reminding experienced players of the starting numbers (in my opinions this should always be on the inside of the lid), pamphlet for learning the game/first time guide, and an almanac with complete rulings for edge cases. At the very least designers should include a clear structuring of their rules documents like this. Risk: Legacy also does a great job of easing players into the rules, but this method works for Risk: Legacy for a very different reason. In Risk: Legacy the evolving game rules are actually designed to be part of the player experience and are advertised to the player as a feature of the game. This way players don’t baulk and the changing game rules, because the game as a whole is actually viewed as composed of10 or so sittings, and not just one. In the end, instruction writing is a difficult art, and one that many people (including myself) have yet to master. More than that though, the state of rules writing right now seems to be fairly underdeveloped, with many avenue left to explore. It's time to get exploring!